Am I Asking for too Much by Wanting an Epic Ending? I...uh...yeah. Breaking Dawn plot tactics, really? What do I even say? What CAN I even say without spoiling? 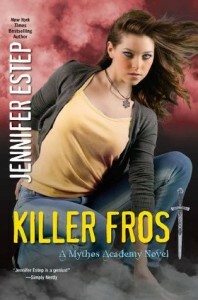 As indicated by my star rating, Killer Frost was my least favorite book of the series, which is a bit of a shame for a series ender. Even so, 3 stars is still a halfway decent rating from me, so all is not lost. 1. It took far too long to get to the point where the story grabbed me and took over. 2. Logan Freaking Quinn (her words oft borrowed by me) was not as shiny as he'd been in the past. I almost forgot that he was there. all up in a fight scene - no. 1. As usual, Ms. Estep put a lot of care and thought into her world and the characters who live in it. Groundwork that was laid in the very first book came back full circle. 2. I appreciate the variety of mythological gods and creatures the reader gets to learn about (or revisit). You can tell that this author loves her mythology...maybe not on the same level as Rick Riordan, but still. I had wished for more information at times than just face-value name dropping, but I've (unfortunately) read much sparser "mythology" founded stories than this one, so I'm happy for the most part. 3. Since it was time to get things wrapped up, at least Gwen got to go out in a blaze of glory. She'd never be able to fill Rose Hathaway's shoes, but the kid's got some guts, nonetheless. I'm ready to close the page on Mythos Academy. It was a fun ride, but the time was due to end the story. I'll definitely be curious to see what series is up next from this imaginative author.